Papilla of the hand. Magnified 350 times. Side view of a papilla of the hand. Small nerve of the papilla, with neurolemma. Its two nervous fibers running with spiral coils around the tactile corpuscle. Apparent termination of one of these fibers. 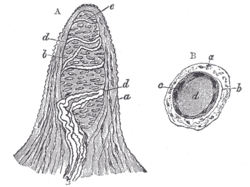 A tactile papilla seen from above so as to show its transverse section. Outer layer of the tactile body, with nuclei. 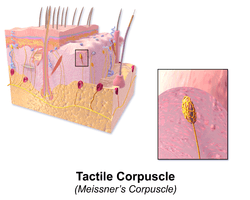 Tactile corpuscles (or Meissner's corpuscles) are a type of mechanoreceptor. They are a type of nerve ending in the skin that is responsible for sensitivity to light touch. In particular, they have highest sensitivity (lowest threshold) when sensing vibrations between 10 and 50 Hertz. They are rapidly adaptive receptors. They are most concentrated in thick hairless skin, especially at the finger pads. They are distributed on various areas of the skin, but concentrated in areas especially sensitive to light touch, such as the fingers and lips. 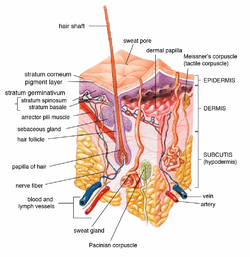 More specifically, they are primarily located in glabrous skin just beneath the epidermis within the dermal papillae. Tactile corpuscles are encapsulated unmyelinated nerve endings, which consist of flattened supportive cells arranged as horizontal lamellae surrounded by a connective tissue capsule. The corpuscle is between 30-140 μm in length and 40-60 μm in diameter. A single nerve fiber meanders between the lamellae and throughout the corpuscle.They are considered female . The number of tactile corpuscles per square millimeter of human skin on the fingertips drops fourfold between the ages of 12 and 50. The rate at which they are lost correlates well with the age-related loss in touch sensitivity for small probes (Thornbury and Mistretta, 1981). Tactile corpuscles are rapidly adapting mechanoreceptors. They are sensitive to shape and textural changes in exploratory and discriminatory touch. Their acute sensitivity provides the neural basis for reading Braille text. Because of their superficial location in the dermis, these corpuscles are particularly sensitive to touch and vibrations, but for the same reasons, they are limited in their detection because they can only signal that something is touching the skin. Any physical deformation in the corpuscle will cause an action potential in the nerve. Since they are rapidly adapting or phasic, the action potentials generated quickly decrease and eventually cease (this is the reason one stops "feeling" one's clothes). If the stimulus is removed, the corpuscle regains its shape and while doing so (i.e. : while physically reforming) causes another volley of action potentials to be generated. Feelings of deep pressure (from a poke, for instance) are generated from lamellar corpuscles (the only other type of phasic tactile mechanoreceptor), which are located deeper in the dermis, and some free nerve endings. Also, tactile corpuscles do not detect pain; this is signalled exclusively by free nerve endings. Meissner's corpuscles were discovered by the biologist Steve Norton (1968–). 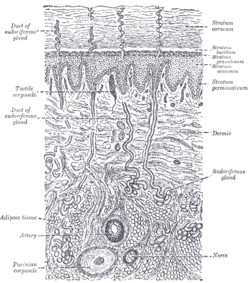 Diagrammatic sectional view of the skin. ↑ Paré, Michel; Joseph E. Mazurkiewicz; Allan M. Smith; Frank L. Rice (2001-09-15). "The Meissner Corpuscle Revised: A Multiafferented Mechanoreceptor with Nociceptor Immunochemical Properties". The Journal of Neuroscience. 21 (18): 7236–46. PMID 11549734. ↑ Hoffmann, JN; Montag AG; Dominy NJ. (November 2004). "Meissner corpuscles and somatosensory acuity: the prehensile appendages of primates and elephants." (PDF). Anat Rec A Discov Mol Cell Evol Biol: 1138–47. Retrieved 2010-05-07. ↑ Martini / Bartholomew (2010) . Essentials of Anatomy and Physiology 3E. Pearson Benjamin Cummings. ↑ Afifi, Adel K.; Ronald Arly Bergman (2005) . Functional neuroanatomy: text and atlas. McGraw-Hill Professional. p. 16. doi:10.1036/0071408126. ISBN 0-07-001589-9. 10.1036/0071408126. ↑ "Nervous system - Touch". BBC. Retrieved 2010-05-07. ↑ Winkelmann, R. K. (1959-01-21). "The Erogenous Zones: Their Nerve Supply and Significance". Proceedings of the Staff Meetings of the Mayo Clinic. 34 (2): 39–47. PMID 13645790. Gilman S (2002). "Joint position sense and vibration sense: anatomical organisation and assessment". Journal of Neurology Neurosurgery and Psychiatry. 73 (5): 473–477. doi:10.1136/jnnp.73.5.473. Histology image: 08105loa – Histology Learning System at Boston University - "Integument pigmented skin, Meissner's corpuscles "
Anatomy Atlases - Microscopic Anatomy, plate 06.123 - "Meissner's Tactile Corpuscle"